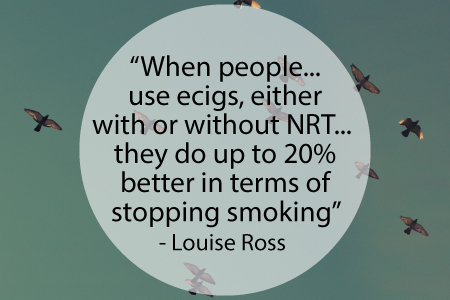 While at the E-Cigarette Summit this year (if you haven’t read our write up, do check it out here – there are some great quotes) I heard Louise Ross speak. Louise is the manager for Leicester’s Stop Smoking Service, the first stop smoking service in the UK to become ‘e-cig friendly’. She gave a great talk, and it was the first time I heard an NHS therapist speak publicly in favour of e-cigarettes. 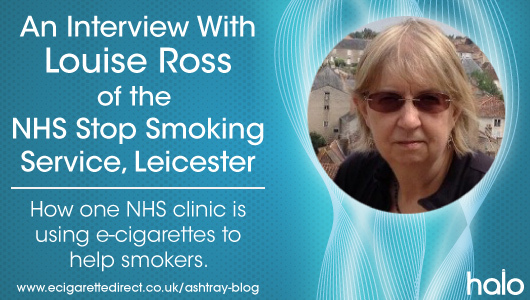 Louise very kindly agreed to talk about her experience using e-cigarettes as part of a Stop Smoking Service. ECD: What was your first impression of electronic cigarettes? LR: It was the cigalikes I became aware of first, of course, and I thought they were quite worrying, I imagined all the usual things that people worry about, like undoing the progress made towards reducing smoking rates. ECD: What influenced your initial impression? LR: That they looked so much like cigarettes, and of course at the same time, people were starting to use these instead of coming to us for help in stopping smoking, which at the time was frustrating. ECD: What made you change your mind? LR: I went to the e-cig summit in London, and realised that I was wrong. I talked to vapers, who gave me a whole new perspective. LR: I realised we could embrace this new technology, and welcome people into our Stop Smoking Service who may never have come if we hadn’t been more open-minded. ECD: Did you experience any resistance to this? If so, from whom? LR: The team were initially very uncertain, but we had a couple of productive meetings with a retailer, who was so very helpful and informative, and the team were quick to see how well this could add to our ‘offer’. There were mixed responses among senior managers and commissioners too, and we are still working through some of that, but the NCSCT (our national training body) has published a great briefing, that helped a lot. Also, from 1.4.14, we were able to collect data about the use of ecigs as part of our data collection. This is a national collection tool. ECD: How did you overcome the objections? ECD: At what stage do you advise someone who’s trying to quit smoking to try electronic cigarettes? LR: That’s a conversation that we try and let the service user lead. We rarely have to suggest it, they ask long before we would bring up the subject, often because they’ve heard about family and friends who have done well with ecigs, or perhaps because they’ve tried everything else and not managed to stop smoking. ECD: Does your stop smoking service actually provide e-cigs, or do smokers being helped have to buy them for themselves? LR: We can’t provide ecigs; service users have to buy them themselves. However this gives people the choice of what they fancy. ECD: Quality can vary enormously between different e-cigs. Do you provide any guidelines on how to choose e-cigs? ECD: Have you seen an improvement in success rates since advising people to try e-cigarettes? ECD: What was the success rate of other NRT’s prior to introducing e-cigarettes as part of the service? ECD: What is your success rate based on? The studies we’ve seen have shown that smoking cessation rates using NRT aids (without additional support) at 12 months have been little or no more successful than cold turkey. LR: Our success rates are based on the combination of a stop smoking product and behavioural support. This raises the success rate significantly higher than use of product alone or going cold turkey. ECD: Is your ultimate priority still to get people to stop using nicotine entirely, or is switching to e-cigarettes an acceptable alternative for people who are unable or unwilling to stop nicotine use? LR: We’ve come to realise that stopping nicotine itself is completely up to the individual. We’re just very happy that they are no longer risking their health through using combustible tobacco. People working in our field will have different views, but I’d like to think that we can keep focused on the benefits of stopping smoking, not fretting about the long-term use of nicotine (which in fact may help people avoid returning to lit tobacco in a crisis). ECD: What is your opinion on flavours – do you think vapers should still be allowed to use a variety of flavour, or do you think these should be limited? LR: We hear a wide range of opinions from service users about what flavours they like – fruit, tobacco, coffee – so I would definitely not want to restrict flavours. ECD: In Gloucester*, an NHS stop smoking clinic has been advising people not to use e-cigarettes. Why do you think they take this approach? LR: I couldn’t comment on an individual service, but I have talked to many other service managers, who are less confident about including non-licensed products in their approach. *Update: We’ve since spoken to Gloucester Stop Smoking Service, and they told us they are not discouraging any nicotine in any form that will help people get off tobacco. Our original report was based on a customer who had been told they had been advised not to use ecigarettes by the service. ECD: What’s your reaction to this? LR: I think Stop Smoking Services need to listen to individuals about what works for them. Ecigs don’t suit everyone, but by offering a person-centred service, and giving behavioural support with the shared aim of helping people to stop smoking when that’s what they’ve said they want to do, we can make a huge difference to smoking rates. ECD: What do you think the future holds for e-cigarettes? LR: I’d like to see the tide turning away from restrictive regulation, medicalisation and moralistic judgements, towards a real understanding that these should be high quality consumer products, accessible to all who want to use them. People who listen to smokers and vapers, could help make that a reality. People who see ecigs as part of the problem rather than part of the solution to the smoking epidemic, will be obstacles to that reality. LR further comment: I can say with certainty that if ecigs were more easily accessible by people with mental ill-health, this has the potential to significantly improve their physical health too. It has long been known that people with poor mental health are more likely to have cardiac and respiratory problems, and access to harm-reduction products such as ecigs is their absolute right. Once again, I’d like to thank Louise Ross for taking her time to answer these questions. Hopefully, this is a step in the right direction for stop smoking services in the UK. 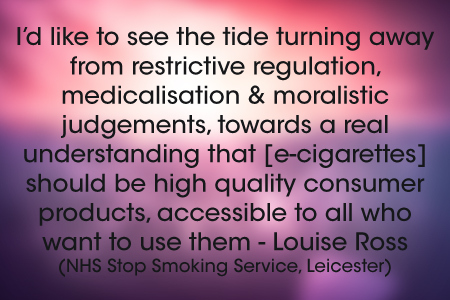 Keep up the good work, Louise and good luck with your valiant efforts in persuading others in the Service to listen to their clients and become part of the e-cig revolution. Can you imagine the rise in “good news” that would come from the media and Government if every SSS in the country gave the thumbs-up to vaping? Thank you, Mark, glad you found it of use. And yes, it would make a huge difference! In fact, Public Health England are trying to educate local councils about ecigarettes (as shown here: https://www.ecigarettedirect.co.uk/ashtray-blog/2014/11/return-of-the-titans-ecig-summit-2.html) but it’s a big job to counter misconceptions. Pingback: Trouble Committing To E-Cigs? Try These 10 Tips From Experienced Vapers!